Apple iPhone and iPad owners can now get more detailed information through Siri digital assistant and official podcasts. App store will also be offering a curated list of popular football news apps and gaming apps. With just a day left before the Fifa 2018 football world cup kicks off in Sochi, Russia on June 14, Apple has updated the company’s digital assistant Siri also iOS App store, podcasts and more to serve users with real-time information on world’s most popular team sport. First up, the Cupertino-based company has added football support for Siri sports feature in Brazil, Russia, Denmark, Finland, Malaysia, Turkey, Thailand, Saudi Arabia and Israel. With the new addition, Siri sports with Football support is now being offered in 35 countries including India. Siri users can ask for scores, schedules, standings and team rosters. Apple Siri sports feature will offer Football coverage in terms of team rosters, team standings, individual player stats, match schedules and more. 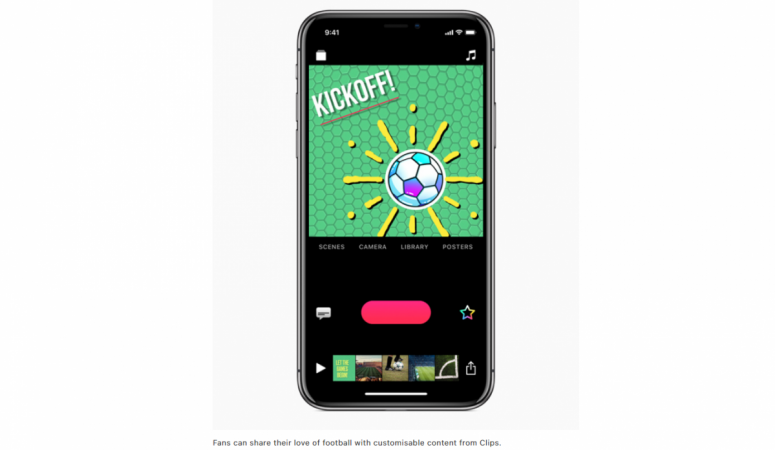 In addition to improving Siri sports feature, Apple has announced that the App store editors will list out best Football related apps including official broadcasters such as FOX NOW or BBC Sport, and games like FIFA Mobile and PES 2018 to play on Apple iPhones and iPads. Additionally, they will also be offering photography tips on taking good football snaps to share it on social media. That’s not all; Apple Music will also help you get in the groove for the upcoming Fifa 2018 Football world cup with curated playlists for each of the 32 participating nations with the most popular artists in each country as chosen by local teams. Sony LIV (Free): SonyLIV is the one of the official Video-On-Demand platform in India that offers Fifa 2018. It also streams UEFA Champions League, UEFA Europa League, French Ligue-1, La-Liga. After the match, users can also catch up with favourite moments such as goals, latest updates and video highlights. Besides the sports, it offers popular content from Sony Entertainment Network Channels, with general entertainment, and offering unlimited access to thousands of hours of entertainment. Users can also simply tap & cast any video to larger screen and use the SonyLIV app as a remote control. You can also download and watch videos offline. FIFA Football (FREE): Electronic Arts (EA) is ready with the newly updated 2018 FIFA World Cup app just ahead of Russia event. It helps users build and manage the team with Cristiano Ronaldo as the star. Then train any player to superstar status, attack opponents, and keep coming back for daily content all season long. Stay connected to real-world football as it happens across the globe. An immersive new experience rolling out weekly, Squad Building Challenges lets you strategically build different line-ups to earn amazing and meaningful rewards for your Ultimate Team. Cartoon Network Superstar Soccer (FREE): This will offer fun and interactive football gaming experience. It offers users to build a team consisting of famous Cartoon Network characters in Superstar Soccer and play as one of 16 different captains from your favourite Cartoon Network shows. Onefootball Soccer News (FREE): It offers 24-hour video streaming service covering exclusively on 2018 football world cup. They also are collaborating with over 50 creators from around the world, as well as the shows & formats (mostly YouTube channels). PES 2018 (FREE): It offers users the unique ways to play games and experience authentic football tournaments on a mobile device. It gives the user the opportunity to form a fantasy team from more than 10,000 stars including former legends Beckham, Maradona, Zico to existing players Messi, Suarez and others. Beside the infield action, it also helps them recreate off-field drama such as acquire players through scouts, agents, or the scout Auction. It offers the choice to pick best players to fit your unique tactics. Captain Tsubasa: Dream Team (Free): this game also helps users pick their favourite players, create their own unique dream team, and battle it out against other users from around the world. The game controls are optimized for smartphones, creating a smooth, intuitive, and stress-free play experience! Compete with other teams to become master of the pitch and conquer the world of football. Messi Oficial (FREE): This app will help football fans get exclusive news and updates about Lionel Messi with exclusive live coverage such as workout sessions and also video messages. If you use the daily hashtags in social media channels, he or she gets a chance to be featured in the app as one of the Messi’s greatest fans. Zlatan Legends (FREE): Though the Swedish iconic player won’t be playing in this world cup, fans can still see and experience Zlatan Ibrahimović every football skills with this wonderful arcade sports game right on their iPhone or iPad. It comes with a reward system based on skill and determination on the football field. Users can make Zlatan play intergalactic tournament and if they happen to make podium finish as the champion of the universe, they stand an opportunity to earn exclusive gift items. Cristiano Ronaldo: Kick’n’Run (FREE): This is tailor-made gaming for CR7 fans. Users will find it interesting play football like Cristiano Ronaldo running style and also exhibit unique skill and precision. He or she can also challenge players online from all over the world and stand a chance to win prizes they go along up the game levels.